Andreeva, S., Kociolek, J.P., Maltsev, E., Dorofeyuk, N., Kezlya, E., Shkurina, N., Kuznetsova, I. Gusev, E. and Kulikovskiy, M. (2018) Sellaphora balashovae (Bacillariophyta), a new species from Siberian mountain Lake Frolikha (Baikal region), Russia Phytotaxa 371(2): 73–83. Jahn, R., Mann, D.G., Evans, K.M. and Poulíčková, A. (2008) The identity of Sellaphora bacillum (Ehrenberg) D.G. Mann. Fottea 8: 121–124. Johansen, J.R., Lowe, R., Gomez, S.R., Kociolek, J.P. and Makosky, S.A. (2004) New algal species records for the Great Smoky Mountains National Park, U.S.A., with an annotated checklist of all reported algal species for the park Archiv für Hydrobiologie Supplement 150: 17-44. Levkov, Z., Nakov, T. and Metzeltin, D. (2006) New species and combination from the genus Sellaphora Mereschkowsky from Macedonia. Diatom Research 21 (2): 297-312. Mann, D.G. 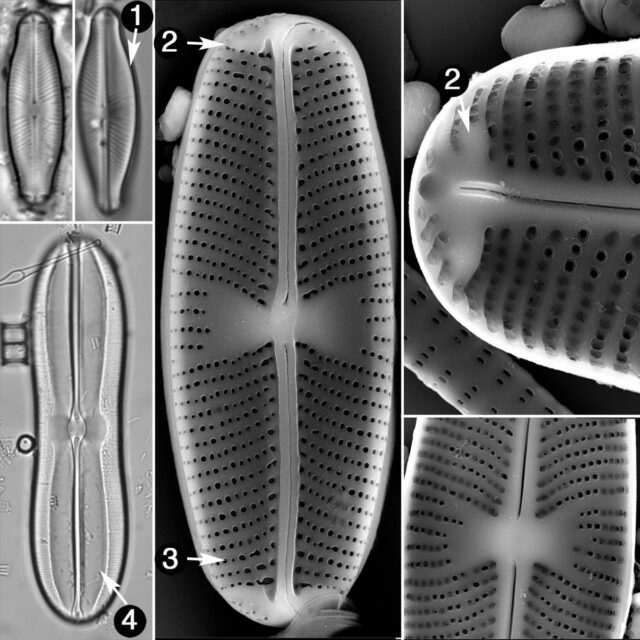 (1989) The diatom genus Sellaphora: Separation from Navicula British Phycological Journal 24: 1-20. Mann, D.G. (2001) The systematics of the Sellaphora pupula complex: typification of S. pupula. In: Jahn, R. et al. (eds) Studies on Diatoms. Lange-Bertalot Festschrift, Koeltz, Koenigstein. Mann, D.G., McDonald, S.M., Bayer, M.M., Droop, S.J.M., Chepurnov, V.A., Loke, R.E., Ciobanu, A. and du Buf, J.M.H. (2004) The Sellaphora pupula species complex (Bacillariophyceae): morphometric analysis, ultrastructure and mating data provide evidence for five new species Phycologia 43: 459-482. Mann, D.G., Thomas, S.J. and Evans, K.M. (2008) Revision of the diatom genus Sellaphora: a first account of the larger species in the British Isles. Fottea 8(1): 15-78.